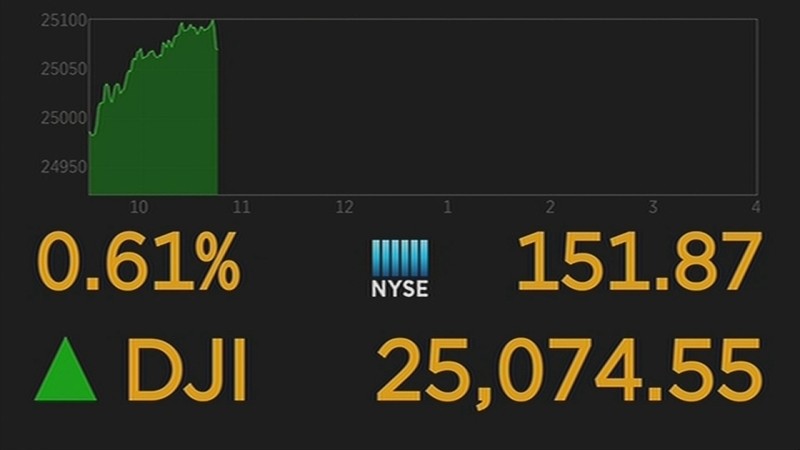 NEW YORK -- The Dow Jones industrial average is trading above 25,000 points for the first time early Thursday, breaking another 1,000-point milestone. The market was rising broadly after a survey showed strong hiring by U.S. private businesses. Banks are leading the way as interest rates jump. European stocks are also rising. KEEPING SCORE: The Standard & Poor's 500 index climbed 12 points, or 0.5 percent, to 2,725 as of 10 a.m. Eastern time. The Dow Jones industrial average rose 147 points, or 0.6 percent, to 25,069. The Nasdaq composite added 18 points, or 0.3 percent, to 7,084. The Russell 2000 index of smaller-company stocks gained 5 points, or 0.4 percent, to 1,558. The Dow reached 24,000 on Nov. 30, just 23 trading days ago. Stocks have climbed since then as investors hoped the Republican-backed tax package would boost company profits this year. The law cuts the U.S. corporate tax rate substantially. The Dow broke through five 1,000-point milestones in 2017, on its way to a 25 percent gain for the year. SURVEY SAYS: ADP said private U.S. businesses added 250,000 jobs last month as health care, retail and professional services companies hired more workers. The survey suggests businesses are optimistic about the economy and expect more demand. The government will release a jobs report Friday that covers both private companies and governments. Economists forecast that will show a gain of 189,000 jobs, according to a survey by data provider FactSet. Meanwhile business activity in the 19-country eurozone reached its highest level in almost seven years. That's based on a survey of manufacturing and services companies. One of the reasons stocks have done so well over the last year is the improved health of the global economy as European countries and both developing and advanced nations around the world experience better growth after years of struggles. European stock indexes climbed. France's CAC 40 leaped 1.6 percent while Germany's DAX gained 1.5 percent. In Britain the FTSE 100 edged 0.3 percent higher. BONDS: Bond prices sank, sending yields higher. The yield on the 10-year Treasury note rose to 2.48 percent from 2.44 percent. Banks made strong gains in early trading as increased interest rates mean they can make more money from mortgages and other loans. JPMorgan Chase gained $2.01, or 1.9 percent, to $109.51 and Wells Fargo rose $1.11, or 1.8 percent, to $62.67. CHIP DIP: Intel continued to stumble after security researchers at Google discovered serious security flaws in its computer processors. It lost $1.90, or 4.2 percent, to $43.36 after a 3.4 percent decline Wednesday. Intel said it's working to fix the problem and that it's not the only company affected. Rival Advanced Micro Devices said it believes its chips are safe and its stock jumped 83 cents, or 7.2 percent, to $12.38. Most of Intel's rivals made big gains Wednesday. Elsewhere among tech stocks, Google parent Alphabet climbed $11.30, or 1 percent, to $1,102.82 and Intuit added $2.44, or 1.5 percent, to $161.60. MORE TESLA TROUBLE: Electric car maker Tesla again said it fell short of production goals for its new Model 3 sedan, which is intended to be its first lower-cost car. The shares skidded $8.47, or 2.7 percent, to $308.78. ENERGY: Benchmark U.S. crude rose 7 cents to $61.70 a barrel in New York. Brent crude, used to price international oils, shed 7 cents to $67.77 a barrel in London. ASIA: Japan's benchmark Nikkei 225 advanced 3.3 percent in the first trading day of the year. South Korea's Kospi lost 0.8 percent while Hong Kong's Hang Seng added 0.5 percent. CURRENCIES: The dollar rose to 112.79 yen from 112.52 yen. The euro climbed to $1.2083 from $1.2018.